Southampton followed up their midweek victory over Watford with a convincing home win against West Brom. 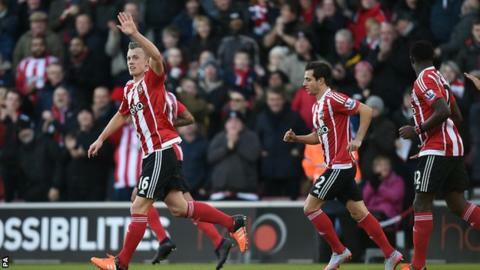 James Ward-Prowse scored a brilliant 25-yard curled free-kick and a penalty for his first goals of the season as Saints cruised into a half-time lead. West Brom boss Tony Pulis made two attacking changes at the break but the home side remained in charge. Serbian forward Dusan Tadic sealed the three points from a tight angle after a clever pass from Matt Targett. Ronald Koeman's Southampton move up to 10th in the Premier League table, while the Baggies stay 13th. Shane Long and Sadio Mane sparkled up front for Southampton, Tadic made a brilliant contribution with his goal, while last season's top scorer Graziano Pelle was on the bench. Before you even get to midfielder Ward-Prowse's two goals, the signing of Charlie Austin from QPR certainly leaves the Saints with plenty of scoring options. Austin was watching on from the stands, and will have been delighted with what he saw from his new team-mates, who played with real fluency and verve going forward. The only minor concern for Austin could be over how regularly he will fit into a team that appears to have rediscovered the qualities that drove them into a seventh-place finish last season. "We like to make the squad stronger, and that means Charlie in, nobody out," Koeman said. "We're looking forward to having more competition. That will be good. Will someone be sold? No. Nobody is for sale in January." The Baggies' showing at St Mary's was a world away from the dogged away performance that earned a 2-2 draw against Chelsea on Wednesday. There was little of the determined harrying that unsettled the home side at Stamford Bridge, with Southampton at times afforded far too much time on the ball. Victor Wanyama (left) played 60 passes, completing 88%. By comparison, Darren Fletcher (right) only played 19. Fletcher and fellow West Brom midfielder Claudio Yacob (46) only managed 65 passes combined. The highlight of the away side's opening 45 minutes was a back-heeled clearance off the goalline by James McClean to block Targett's low shot - denying the 20-year-old a deserved goal for his excellent overall performance. In West Brom's defence there was an improvement after Pulis' attack-minded substitutions at the break, but Southampton were intelligent in the way they protected the lead, and ruthless in the way they extended it. Southampton manager Ronald Koeman: "Ward-Prowse's early free-kick opened the game. It gave us confidence, meant we could control the game. West Brom manager Tony Pulis: "You've got to give Southampton credit, they were the better team and deserved to win the game. "It just wasn't our day. All season we've done well away from home. Today we didn't and got punished." West Brom play away at Bristol City in an FA Cup third-round replay on Tuesday before hosting Aston Villa in the Premier League on Saturday. Southampton's next match is at Manchester United in the league, also on Saturday. Match ends, Southampton 3, West Bromwich Albion 0. Corner, Southampton. Conceded by James McClean. Second Half ends, Southampton 3, West Bromwich Albion 0. Hand ball by Claudio Yacob (West Bromwich Albion). Attempt missed. Chris Brunt (West Bromwich Albion) left footed shot from outside the box misses to the right following a set piece situation. Attempt blocked. Salomón Rondón (West Bromwich Albion) left footed shot from outside the box is blocked. Substitution, Southampton. Cuco Martina replaces Cédric Soares. Corner, West Bromwich Albion. Conceded by Victor Wanyama. Goal! Southampton 3, West Bromwich Albion 0. Dusan Tadic (Southampton) left footed shot from a difficult angle on the left to the bottom right corner. Assisted by Steven Davis. Offside, West Bromwich Albion. Victor Anichebe tries a through ball, but Craig Gardner is caught offside. Attempt missed. Victor Anichebe (West Bromwich Albion) right footed shot from outside the box is close, but misses to the left. Offside, West Bromwich Albion. Chris Brunt tries a through ball, but Stéphane Sessegnon is caught offside. Victor Anichebe (West Bromwich Albion) wins a free kick on the right wing. Attempt missed. Sadio Mané (Southampton) right footed shot from the right side of the box misses to the left. Assisted by Shane Long. Attempt missed. Stéphane Sessegnon (West Bromwich Albion) right footed shot from outside the box is too high following a set piece situation.